Print your logo onto these custom printed neoprene tablet sleeves or one of our other innovative office pencil cases and use them in your next marketing campaign as a unique giveaway item. Have your custom printed Neoprene Tablet sleeves in your choice of colour to match your corporate identity. Neoprene pouches for ipads are great to protect them as they are nicely padded. The soft neoprene padding, stitched outer trim, reversible sleeve, ultra soft, lightweight, 11.8 x 9 inch dimension, compatible with iPad Air, iPad 2 3 4 and other tablets bringing much of the convenience to your customers. Custom brand these pvc pencil cases or one of our best-selling promotional office accessories»office pencil cases with your company logo! Your promotional neoprene tablet sleeves can be silk screen printed in 1 or more colours. 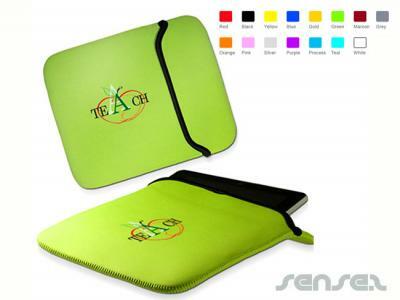 Costs shown include a 1 colour logo print on your custom branded neoprene tablet sleeves. We can print more than 1 colour, however it incurs extra costs. We can achieve a perfect PMS colour match for the print. Personalise your neoprene tablet sleeves or custom design office pencil cases for your marketing campaign. How can these unique promotional neoprene tablet sleeves or our personalised office pencil cases fit in with your marketing strategy and help you maximise your brand exposure? Our custom made Neoprene Tablet Sleeves can be produced from a minimum quantity of 100 pieces. We can have your logo branded on these corporate Neoprene Tablet Sleeves in 1 Colour Silkscreen Print. A setup fee of NZ$191.00 will apply to make the film.